Hug Smartwatch is the world’s first Gesture controlled smartwatch. Hug is an Indian company which is based out of Hyderabad. It was started by Raj Neravati who comes from a technology background and has worked in the US for several years. The innovative smartwatch has certainly hit the Wearable market with a storm and has been a bestseller in the smartwatch segment in India. The company has won few awards from international communities since the time they’ve launched the company in 2016. HUG Smartwatch is the world’s first and only gesture control Smartwatch that provides a new way of interaction with the digital world. The watch is one of the lightest smartwatches on the planet and weighs only 46 grams. It is power packed with functions like Gesture control, Personal Safety (SOS), Fitness Tracking, Nutrition, Calls, Notifications, Remote Capture, Find my Phone and more that makes it a great smartwatch. Certainly, this is one of a kind smartwatch in India focused on innovation and ease of use for the fitness freaks. The HUG smartwatch provides 2 unique features that other smartwatches in the market do not have. With the help of hand gestures – such as Push, Pull, Up, and Down – you can do various things with this smartwatch. You can play/stop/pause music, increase/decrease the volume of music, play a game using your VR device, do a powerpoint presentation and also fly a drone. Below is a video that will show you how the gestures work with the HUG smartwatch. With the push of an SOS button, your loved ones will be notified in case of an emergency like Accident, fall etc. With your prior permission, Hug smartwatch reflexively reacts to threat situations and sends a distress signal to your closed ones, not to mention nearby emergency services. You can also set up a hand gesture as the sign of trouble, for situations where your discretion is key. This gesture-based safety can be turned on/off using the touchscreen on the smartwatch. Step Count Tracking, distance covered, heart rate monitor, calories burned, Laps etc. It tracks your food intake and water intake along with different activities performed throughout the day. 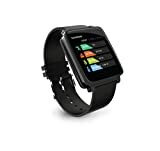 Call notifications – You can pair the HUG smartwatch with your smartphone to view your call logs and make/receive calls directly from this smartwatch. It syncs with various applications such as WhatsApp, MS Outlook, and Facebook. 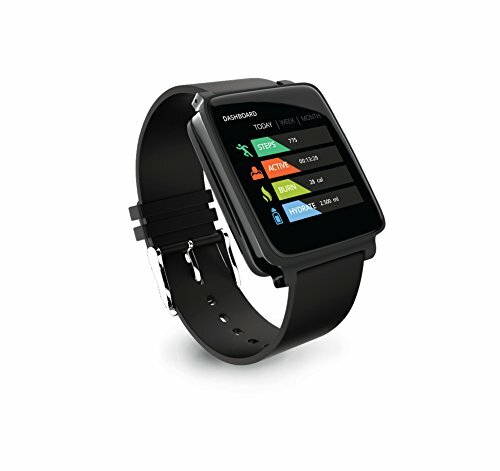 Once synced, you can view messages on your Hug smartwatch. Location Tracking – You can use the “find my phone” feature to locate your smartphone in case you lose it. Music Control – You can play music either by touching the screen or by hand gestures. Alarm – You can set vibration alarm in your smartwatch so that nobody around you gets disturbed. Taking Pictures / Selfies – You can click photos on your mobile phone by using remote capture feature on the smartwatch. The battery of HUG smartwatch is one area where it can improve. While it offers 2-day battery life, other similar devices in the wearable market have an average battery back up of 7-10 days. HUG needs to improve its battery. You can easily charge the battery which is at the back side of the watch and it has a magnetic charger. The company claims that the device is splash proof and not water resistant. Therefore I would not dare to wear this smartwatch in the shower or swimming pool. The Hug Smartwatch comes with a Rubber Strap of a decent quality. You have an option to buy either the black or white color watch. The demand for the black colored watch is more than white and therefore the white colored watch is much cheaper than the black one. After reading the entire article I am sure you would be able to see many benefits of the HUG smartwatch. At the price range of approximately 10K INR, the watch gives you a real value for your money. The only improvement area of the HUG smartwatch I feel is the battery as it only provides two-day battery back-up and therefore you need to charge it every alternate day. I think HUG innovation is a smart company and they will soon make an improvement in its battery.